While the history of Chateau Cabrieres dates back to the fifteenth century in the Southern Rhone Valley, the modern era for the winery begins when it was purchased by the Arnaud family. The estate takes its name from one of the lieux-dits where there vines are planted in, Cabrieres. So far, three generations of the family have manged Chateau Cabrieres. Prior to 1955, the harvest was sold to negociants. Starting in 1955, Chateau Cabrieres began to produce, bottle and sell their own wine. Previously, the wine was sold under the name of Domaine Cabrieres, but that changed at some point after the 1960’s when they altered the first part of the name from Domaine to Chateau. Chateau Caberies added to their holdings in 1995 when they purchased another Chateauneuf du Pape estate, Chateau Maucoil, which they later sold. In 2008, a lawsuit was filed by Carole Arnaud against her father, Guy Arnaud. In the lawsuit, Carole Arnaud claimed that she was owed back wages and more importantly, that Chateau Cabrieres was adding grapes from outside the appellation to their wine. Those claims were proven to be false. The family then divided their holdings and Carole Perveyrie Arnaud is no longer involved with any of the Arnaud family vineyards in Chateauneuf du Pape. She started her own vineyard with 8 hectares of vines she was given as part of the settlement. Today, Chateau Cabrieres is owned and managed by Agnes Arnaud and her husband, Patrick Vernier. The wine making and vineyard management is consulted by Philippe Cambie. Chateau Cabriers has 20 hectares of vines in Chateauneuf du Pape. 2 hectares are reserved for the production of Chateauneuf du Pape Blanc. They have a terroir of gravel, sand and quartz pebbles in the soil. Chateau Cabrieres is one of the few Chateauneuf du Pape properties to plant 13 allowable Rhone grape varieties. The combination of 3 distinctive terroirs and 13 varieties allows Chateau Cabrieres to produce a myriad of wines from the Rhone Valley. The estate considers their viticultural practices to be bio rational. They strive to be as sustainable as possible. The vines vary in age. The oldest Grenache vines are more than 100 years old. While they have some of the regions oldest vines at more than 100 years of age, on average, their vines are close to an impressive 50 years of age. 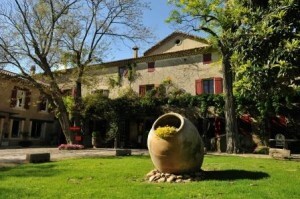 Chateau Cabrieres produces 4 red Chateauneuf du Pape wines and 2 white Chateauneuf du Pape wines. Cabrieres Chateauneuf du Pape – A blend of 50% Grenache, 20% Syrah, 20% Mourvedre and 10% Cinsault. The terroir is very rocky, with small stones. The wine is aged in used, French oak barrels for 12 months and then foudres for additional aging. The production is slightly more than 9,000 cases per year. Until the 1998 vintage, this wine was previously produced as Cabrieres Chateauneuf du Pape Tradition. Cabrieres Prestige – With at least 50% old vine Grenache that is more than 100 years of age along with, 15% Syrah, 15% Mourvedre and various amounts of Cinsault, Vaccarese, Counoise, Picpoul, Picardan, Clairette, Bourboulenc Muscardin, Roussanne and Terret Noir. The grapes are completely destemmed. The wine is aged in mostly used, and some new French oak barrels for 18 months. The production is only 250 cases per year. The wine made its debut in 1988. The production is 500 cases per year. Cabrieres Centenaire – Making its debut in 2000, the wine is made from vines over 100 years of age, the wine comes from a blend of 13 different varieties, although it’s dominated by old vine Grenache. The wine is aged in mostly used, and some new French oak barrels for 18 months. The wine is only produced in the best vintages. The production is on average 400 cases per year. Cabrieres Le Grand Rocasson – The wine is made from a blend of 80% Grenache and 20% Syrah. Chateau Cabrieres Blanc is made from a blend of 40% Grenache Blanc 40% Clairette, 10% Bourboulenc and 10% Roussanne. The wine is aged for 4 to 6 months in new, French oak barrels before bottling. The production is about 500 case per year. Chateau Cabrieres Blanc Prestige is produced from 30% Grenache Blanc 30% Clairette, 30% Bourboulenc and 10% Roussanne. The production is about 175 case per year. Cabrieres Lettre a Louis Arnaud – From mostly 100% Old Vine Grenache with minor amounts of other varietals added on occasion. The vines used to produce this special wine date back to between 1900 and 1902! Part of the reason Cabrieres Lettre a Louis Arnaud was so good is that the wine is made from naturally low yields that are close to 10 hectoliters per hectare. The wine was only produced in 2000 and 2001 and was made for export to the American market. Chateau Cabrieres can be enjoyed on the young side. Young vintages can be popped and poured, or decanted for about 1 hour, give or take. This allows the wine to soften and open its perfume. Older vintages might need very little decanting, just enough to remove the sediment. Chateau Cabrieres is usually better with 3-5 years of bottle age. Of course that can vary slightly, depending on the vintage. In the best vintages the wine should be consumed within 4-15 years after the vintage. Cabrieres is best served at 15.5 degrees Celsius, 60 degrees Fahrenheit. The cool, almost cellar temperature gives the wine more freshness and lift. Cabrieres is best served with all types of classic meat dishes, veal, pork, beef, lamb, duck, game, roast chicken, roasted, braised, stewed dishes, sausage, barbecue and cassoulet. Cabrieres is also good with Asian dishes, hearty fish courses like tuna, mushrooms, pasta and cheese. The white wine of Cabrieres is best served with a myriad of different seafood dishes, shellfish, crab, lobster, sushi, sashimi, chicken, pork and veal, as well as Asian cuisine. Cabrieres Les Silex, Cabrieres, Prestige Tete de Cru and Cabrieres Cuvee Pontificis are no longer in production. Chateau Cabrieres also owns 5 hectares of vines in the Cotes du Rhone appellation where they produce both red and white wine. Rich and supple, with layers of sweet, ripe, juicy, red plums, cherries and kirsch, the wine is silky, fresh, juicy and lively, with length and sweetness in the spicy finish. The wine was made from a blend of 50% Grenache, 20% Syrah, 20% Mourvedre and 10% Cinsault. In time, this could be even better when it all comes together. Polished, supple and silky textured, on the palate you quickly discover loads of fresh, sweet fruits, packed with garrigue, kirsch and black raspberries. The finish continues in the same vein with just picked, peppery black raspberries. The wine was made from a blend of 50% Grenache, 20% Syrah, 20% Mourvedre and 10% Cinsault. Supple textured on the palate with loads of fresh, sweet red fruits, packed with garrigue, kirsch and black raspberries. The end notes carry through with a spicy, black raspberry, clean sweet finish. The wine was made from a blend of 50% Grenache, 20% Syrah, 20% Mourvedre and 10% Cinsault. Medium bodied, finesse style wine with a light, fresh, sweet, thyme and ripe, red berry finish. Medium bodied, forward, soft in texture, with a peppery edge to the sweet, ripe, juicy kirsch, thyme and fennel notes. This is already easy to drink. Peppery, red berries, vanilla, smoke and herbal characteristics mesh with the medium/full bodied, soft, round, black raspberry and cherry filled personality. This is already drinking well. Ready to drink and already showing its black, red and white cherries, pepper, earth and thyme infused, round, lusty profile. This obscure wine is only made in select vintages and in very small amounts, about 100 cases give or take. Filled with herbs, black cherries and blackberries, this concentrated, unctuous style of wine has a lot to like.